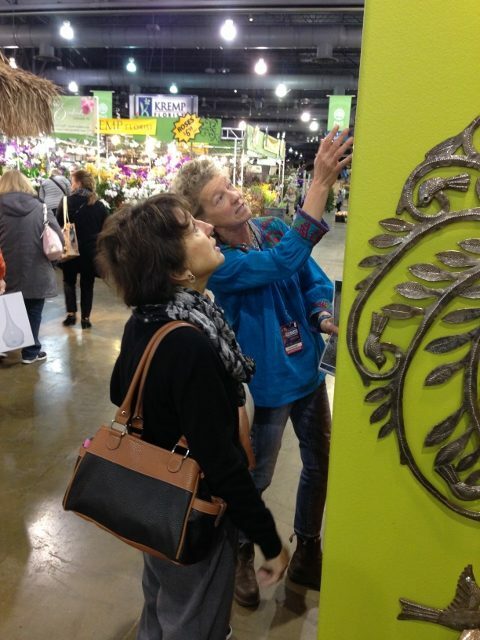 We’ve just wrapped up another Flower Show season, having purveyed Haitian metal to blizzards of happy shoppers in Seattle, Philadelphia, and Boise. And while they were FLOWER shows, the biggest hits of the season were…..sea life sculptures. I suppose it’s not so strange when you think about it. All three of the shows were in the northern tier of the country, and let it be said, the northern tier had more than it’s share of winter in the past several months. (Let’s not even talk about “snowmageddon” or cyclone bombs!) So it’s probably to be expected, after such a winter, that thoughts can easily march right past April showers and May flowers to beach combing and lounging poolside in the warmth of a sunny summer’s day. While our gold-standard birds, sun faces, trees of life continued to be popular, we worked especially hard in the months before the shows to make our sea life sculptures ever more beautifully crafted and finely detailed. How wonderful that those efforts paid off. 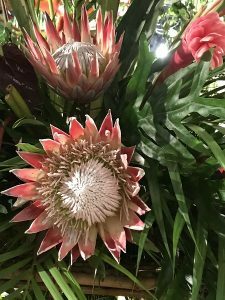 The enthusiasm of our Flower Show customers was proof positive: They really are great! 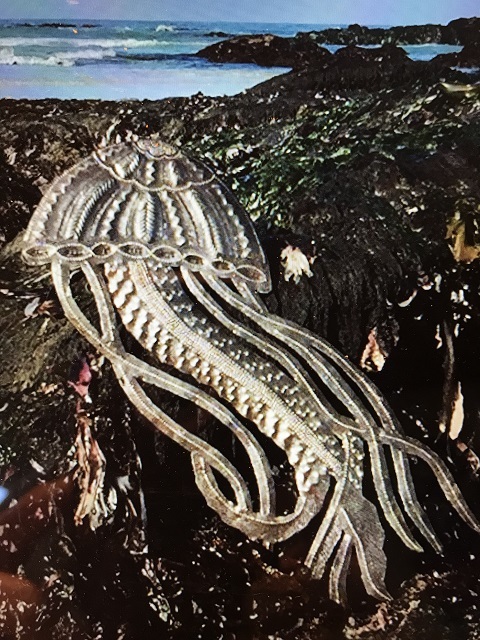 See for yourself…..
Kendy Bellony created this jellyfish with details so intricate, it looks as if its trying to get back to the sea. 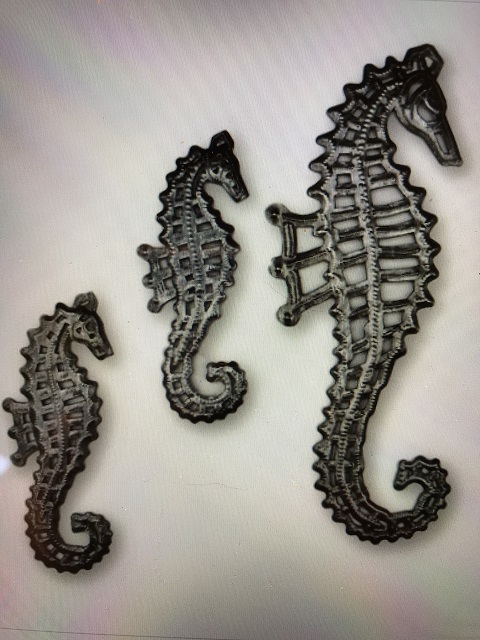 A floating set of three sea horses for display at the beach house on the shore or the bungalow in town. Please Ma’am, Can I have some more?? No, I haven’t fallen off the good grammar wagon. Remember the line from the film “Oliver”? The little street urchin asks for more porridge to re-fill his freshly emptied bowl. Of course, a meager meal is one thing and art is quite another, but sometimes, whether porridge or metal sculptures, we just can’t get enough. We want more. 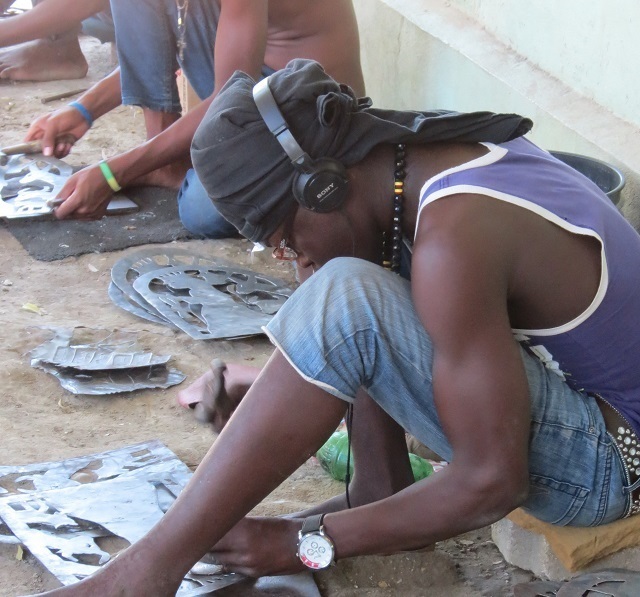 So you want more metal art from Haiti. Marvelous! 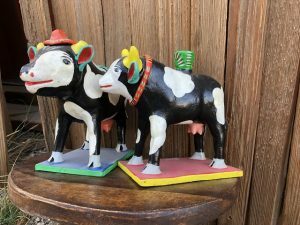 Obviously, if you are on this website, you know that you can get it here, along with fabulous folk art treasures from Guatemala, Ecuador, Bolivia, Peru, Mexico and beyond. On our website you have the greatest selection, with the benefit of access to our entire inventory. Additionally, you trade directly with us to procure these treasures. Not a bad way to go. Having said that, there are other avenues at your disposal to which I am only to happy to direct you. 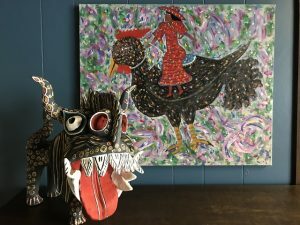 It may seem strange that I would do so, but the bottom line is this: Whether you buy at a retail show in Philadelphia, a Farmer’s Market in Santa Cruz, on our website, or on another website on which we have made our Haitian metal art available, you are directly supporting the artist that made your piece. To buy our art on Etsy, simply type “Artunderthetree” in the search box at the top of the home page. 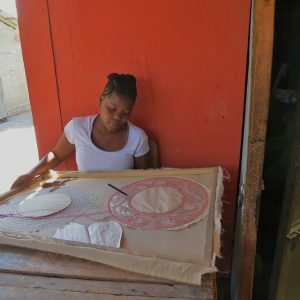 Art Under the Tree is a specially designated collaborative effort with local Haitians to teach business skills and exchange ideas in the best traditions of Fair Trade. The name, Art Under the Tree was suggested by the artists themselves. 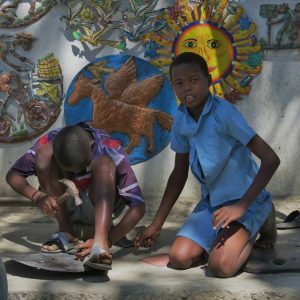 While they often have physical structures which they use as workshops, during hot summer months, it is cooler and breezier to produce their art under the tree! You also have access to over 550 pieces of our art on Amazon, many of which are available on Prime. That, of course means free shipping! To find us quickly, type “It’s Cactus – metal art haiti” in the search bar at the top of the home page. Easy as pie. 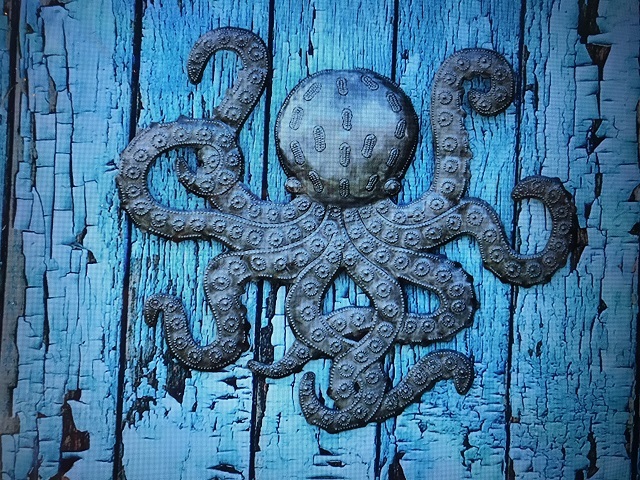 So to recap, we are happy to offer fantastic recycled metal sculptures, handcrafted by our artist partners and make them available to you in strict and faithful observance of Fair Trade practices. 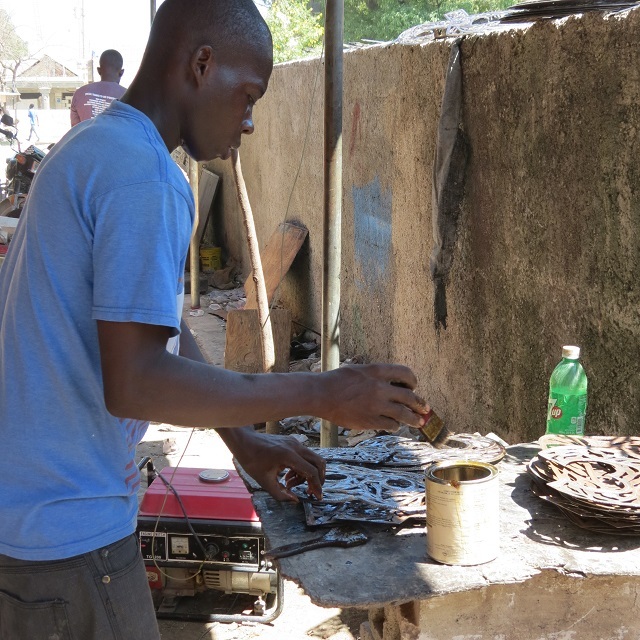 Whether you buy on our website or another, whether you get your art at a retail show or farmer’s market, or street fair, you can be assured that you are supporting artists and their families in Haiti and making a positive impact on their lives. Way to go!!! 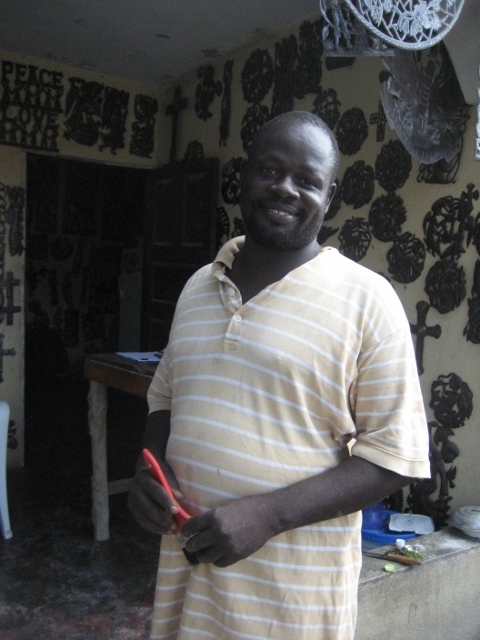 Jean Claude Soulouque, one of our top artists, has seen his business has grown tremendously through your purchases. Have you seen our new Guatemalan beaded accessories? 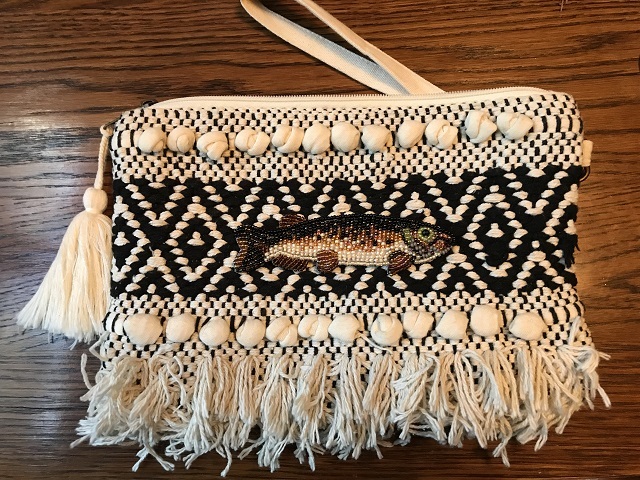 On a recent buying trip to Guatemala, Casey came across some tremendously talented bead artists near the shores of Lake Atitlan, in the central highlands of the country. Women there are undertaking this delicate craft, designing and producing intricate bead work to support their families. Needless to say, those were the magic words! Casey bought up the best of their wares – paying fairly and upfront of course, fair trade is our game after all. Now happily, we can share them with you! Each item of bead work is created by individually sewing together tiny seed beads sourced from the Czech Republic. Unlike weaving, which has been practiced for centuries among the Mayans of Guatemala, beading is a relatively new craft. 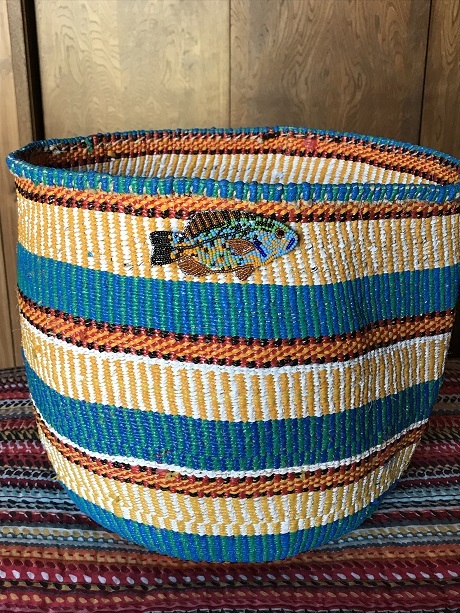 Indigenous women are now producing a growing variety of designs and their excellence in execution continues to soar. As you peruse our website, you’ll find ornaments to hang, bracelets, necklaces, hatbands and pins. Ah yes, that brings us to pins…..
It’s funny, but not everyone knows what to do with a pin, besides fastening it to a lapel. They are so versatile! Accessorize your clothing, accessorize your accessories! Even use them on decorative items around your home. How many times have I said it? You are limited only by your imagination. Here are a few ideas to get you started. Get creative and above all, have FUN! 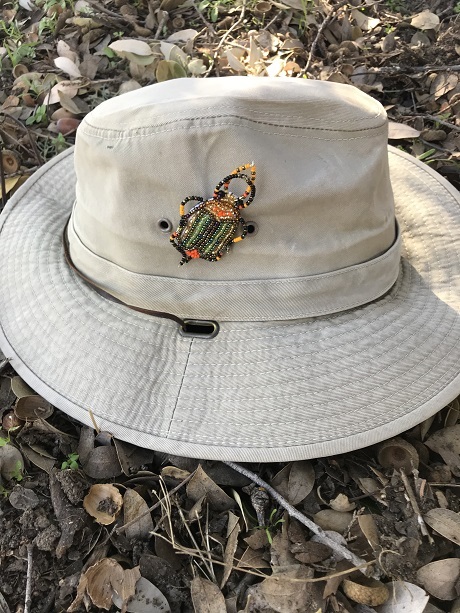 Affix a colorful beetle to your favorite gardening hat. 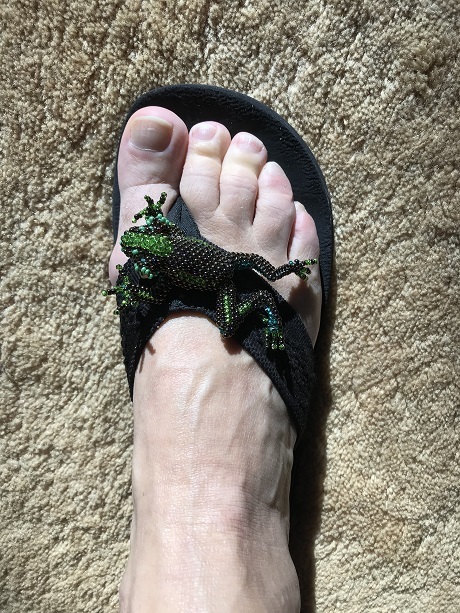 Jazz up some plain ol’ flip-flops. Add a colorful pin to a bright basket. Collectors are always fun to shop for. It’s like baking a cake for someone with a sweet tooth. You know they’re going to love it. People collect so many different things, and for reasons as varied as the collectors themselves. One friend of mine collects roosters. Why? Simply because her husband was born in 1957, the Chinese Year of the Rooster. Another friend, nicknamed “Moo” collects – you guessed it – cows. Moo has great fun with her sizeable collection, the piece de resistance of which is a full-sized “Ben and Jerry’s” cow statue. 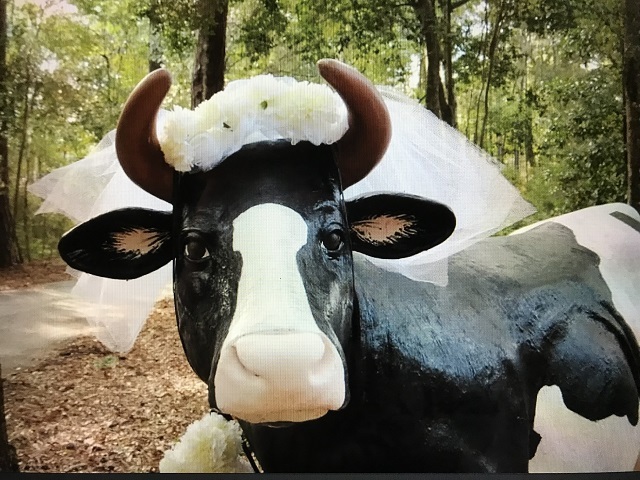 “Matilda” stands pretty close to the middle of Moo’s long, wooded driveway and she is adorned tastefully, yet whimsically as fits the season or occasion. Picture wreaths at Christmastime, Easter bonnets of wonderous flourish, and a sweeping bridal veil heralding a family wedding. Consider then, the collectors in your life, and follow with some thought to what shopping looms on the horizon. Birthday, house-warming, hostess gift, Christmas – they all do pop up. Got a lover of cows on your list? Roosters? Dragons? Bees? It’s Cactus just might have you covered! In all price ranges, sizes, and mediums. Best of all, your gift purchase will be in direct support of the artist who made it. Handmade, fair trade, and back to the cake for the sweet tooth: They’re going to love it! 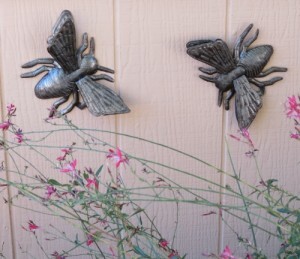 Bees can swarm the collection indoors or out. Beautiful Ortega bovines, which no collector of cows should be without. 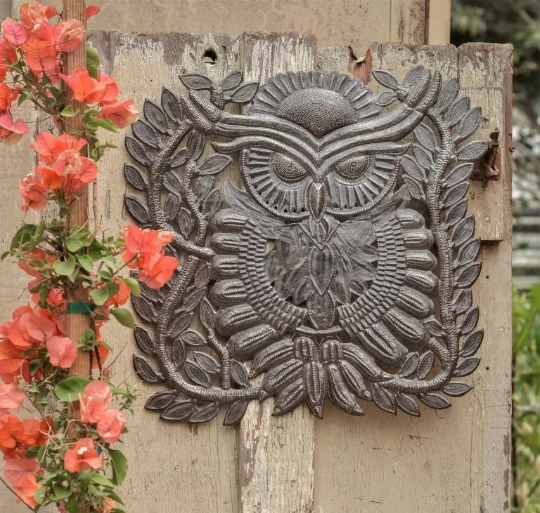 Exceptionally detailed owl sculpture to hang indoors or out in any season. hauls out owls of every shape, size, and function in the fall but why? Are they the right color for autumn décor? I suppose they are, in the sense of intense golden eyes and feathers in rich, luxurious shades of brown that many of them have. Is their seasonal popularity linked with Halloween? Their plaintive “Whooooo” is mournful and positively eerie coming as it does in the dark of the night. In that regard, owls “fit” the spooky theme. I dug for a plausible scientific explanation that binds owls to the idea of fall. According to such venerable sources as, “The Barn Owl Trust,” and “The Cornell Ornithology Lab,” many species begin their courtship rituals in mid-to-late autumn, making them more vocal as they beckon their lifetime mates to come hither. Also, avid bird-watchers and casual observers alike realize that owls are more visible during the fall since the tree limbs have become bare. So there’s that. It seems that autumn and owls do lend themselves to linkage. But why should it be limiting? Owls are wild and free. They soar the skies and penetrate the darkness. If they can do all of that, they can hang in your living room in the spring! Why not??? When they are portrayed in artwork this beautiful, they should be out anytime. All the time. It’s always owl season! The textiles; mantas, belts, monteros, and more are indeed beautiful. And they are becoming increasingly hard to come by as the skills required to create them are lost among younger generations. Interest in acquiring centuries-old weaving skill is steadily giving way to learning skills which are more financially lucrative. Vintage clothing and textiles are thereby becoming increasingly rare and valuable. But what is vintage, actually? Old? Oldish? In my mind, vintage is phase on a continuum. Older than retro, surely, but not as old as “antique” and definitely not to be confused with “dated!” However, concurrent with the idea of vintage are the ideas of fashion and style. The more I think about it, the more I am convinced that fashion comes and goes, but style is forever. Style connotes an an elemental endurance, intelligence in design, and fineness of craftsmanship. Fashion is transient. Things are adapted constantly to BE fashionable, but the best HAVE style. Whether we label items as “retro,” “vintage” or “antique,” they have inherent style. The words – no matter if they describe clothing or cars or furniture or art – refer to things that are not merely fashionable or “on-trend,” they imply something better. They indicate the relative age of a well-made item of intrinsic value that will never go out of style. In a word, such items are timeless. Casey’s cartons of vintage Latin American textiles have that timeless quality. 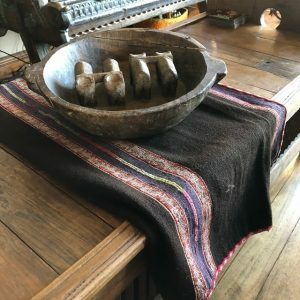 Each piece was painstakingly crafted by artisans living high in remote Andean villages. The weaving techniques used reflect generations of family tradition, indigenous materials, and local meaning. Each piece tells a special story about it’s origins. Yes, she uncovered a treasure chest indeed! Recently, I was filling out a portion of the application for renewal of our Fair Trade Federation certification. One of the questions read as follows: “How often does your business evaluate children’s roles in production?” It was clear to me that this question was leading to the defense against practices of children being forced to work and thereby unable to be children. Children who can play and go to school and relax on a lazy day in the sun. You can bet that It’s Cactus is firmly in that camp. Kids should be kids! Certainly there are endless heart-breaking examples of children being treated as little more than slaves, forced by economic circumstance to labor long hours at the expense of their education, and furthermore, their childhood. 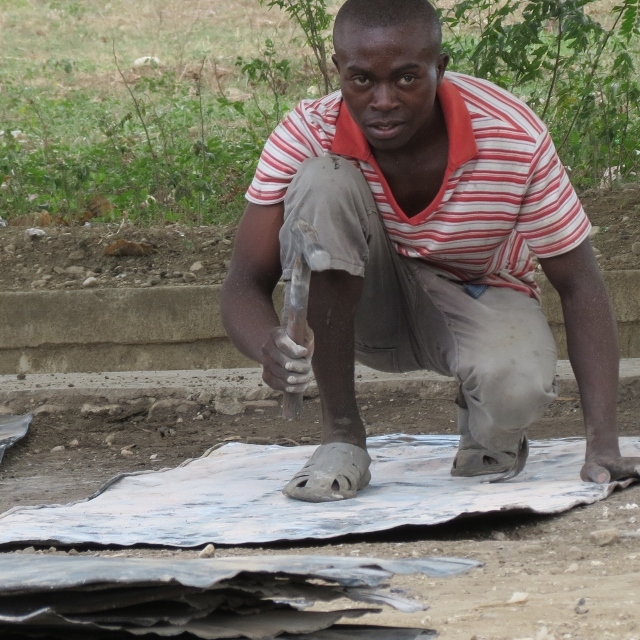 I have blogged about such children in Haiti, who suffer under the restavek system. (Sept. 13,2013 The Price of Poverty: 300,000 Cinderella and No Ball.) They are children of poor families “given” to be raised by wealthier “foster families” of dubious intent. In exchange for labor, a restavek child is supposedly afforded the opportunity for an education. All too often, however, that exchange for the child translates into exploitation and abuse. Though we have never seen this practice in our own Haitian experiences, we stand in total opposition to it. In fact, our work in Haiti is undertaken to elevate economic conditions so that such practices are no longer even considered to be possible solutions to a problem. We strive to make them unthinkable. Though it shouldn’t be surprising, it is, a little bit. Our humble little handmade belts from Guatemala have been selling like hotcakes for months now. They are colorful, versatile, and just right for oh-so many things. Not only that, they are wonderful, traditional folk art items with a distinctive place in Guatemalan cultural history. 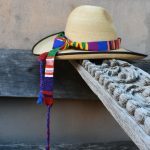 The ancient Mayans, whose ancestors compose a great deal of Guatemala’s current population, placed a high value on the weaving skills of their women. Over a thousand years ago, the Mayans cultivated cotton for textile production. Vegetable dyes were concocted by the men, who also dyed the cotton fibers, but from there the women took over. Spinning and then weaving the threads, they formed in intricate patterns on simple backstrap looms. Women of royalty were taught to a supremely high level of skill and used cotton fiber of the highest quality to create textiles of great complexity. The peasantry did not, of course have access to the finest cottons, and the garments they made were often simpler, but in both cases the ability to weave was a measure of a woman’s worth. Interestingly, ancient Mayan steles have been discovered by archaeologists who have identified the goddess of weaving, Ix Chel, busy at her work. She is depicted as sitting with her backstrap loom, one end tied to a tree and the other affixed around her waist. The Cosmic Weaver holds the shuttle in her left hand, poised to pass the warp threads through the weft, as generations of mortal women have ever since. Today, Rosa creates our woven belts in exactly the same manner. 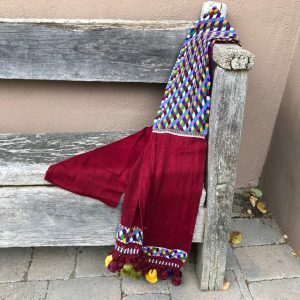 We have been buying her handcrafted textiles for years and always, the pride of her family, village, and culture is worked painstakingly into every piece. 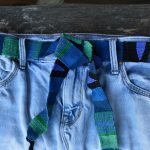 We call them belts or hatbands, and in fact they can be used either way. But that’s not all! 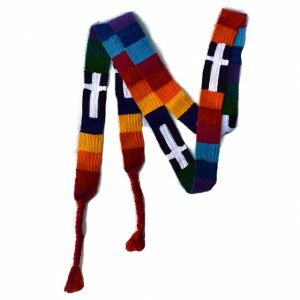 We have seen them affixed to mortar boards at graduations, used as trim on pants and jackets, and as curtain ties – all with great result! They can be used to tie up packages, or to add color and Latin flair to small holiday trees and wreaths. Though the origins of handwoven Mayan textiles go back millennia, the look is hot, hot, HOT today! It is shameful to me that, with the multitude of opportunities I have had throughout my life to change the fact, I am monolingual. Sad but true. English is the only language for which I have any real skill at all. Having spent time in several foreign countries for a significant portion of my adult life, it’s not like I couldn’t have learned. I just didn’t. Well, it’s not like I didn’t learn ANYTHING. I can order rice in Thailand in Thai, I can ask for directions in German, I can say my colors and numbers in French, and I can ask the Spanish-speaking guide in Ecuador how much further we have to walk through these mountains to get back to the car. But that is the pinnacle of my achievement. 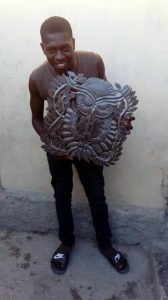 Therefore, it is hard to be critical of our Haitian metal artists that write to me in English to give me their biographical information so that I can share their stories with our customers. In truth, I am impressed that they can do it at all. For that matter, I am impressed that they even try. Creole is the mother tongue in Haiti – a blend of French and West African languages – and my pidgin French is of little use between us. In fact, it gets me into trouble because I think I understand when I don’t. Or sometimes, I don’t understand that I don’t understand, which is even worse. In the first place, Haitian names are elusive. Generally, Haitians call each other by their first names, but they write them family name first. So Wiseton Brutus is Wiseton to his friends, but he signs his name on his work as Brutus Wiseton. What I took to be a great propensity for naming boy children Brutus is actually just a very big family with many households in Croix-des-Bouquets. Notice that I said, “generally.” That’s because sometimes they both call each other and write their names first name first. Julio Balan is Julio Balan. The fun is figuring out who does what. It’s a pretty good game! By far the most challenging are the shots out of the blue. The information offered is not related to anything I’ve asked, yet it is put down earnestly with every hope that it will be helpful to me and of interest to the people that buy their work. There have been many examples over the years, but here is my current favorite: “i in metal since when i was 15 years old i still work because i love my job i am a selibate.” Um. Yes. Some things are just lost in translation. We are back from the Pennsylvania Horticulture Society’s Flower Show and happy to report that it was another successful run. 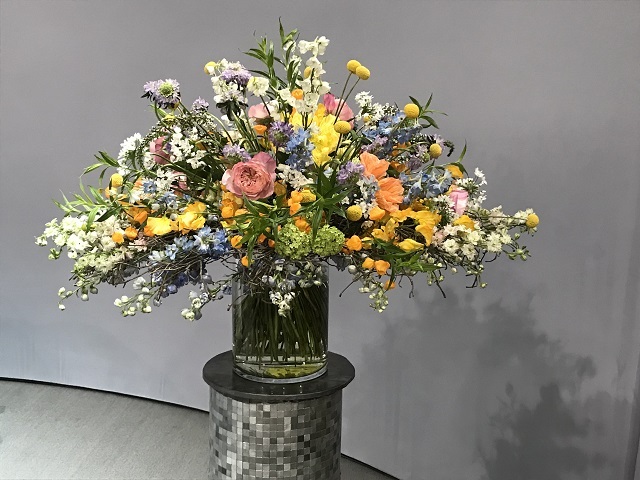 Despite snowstorms and every sort of precipitation that Mother Nature could cause to fall during the ten-day event, the Flower Show participants proved their mettle and pluck and came in great numbers to revel in the beauty of the event….and to SHOP! The It’s Cactus crew was pleased to welcome old friends and new to our brightly-colored signature booth. This response may sound flippant and seem like it evades the question, but it is actually an important point. By trading in this manner, the artists do not have to make initial outlays for materials and labor out-of-pocket and wait for the return on their investments. Such lags, while endurable in strong economies, are virtually untenable in Haiti. Paying up front eliminates that stress and financial burden for the artist, and in many cases, makes trade possible at all. In fact, paying 100 percent up front far exceeds the amount required by the Fair Trade Federation of its members. Moreover, prices are negotiated with the artist for each design that we purchase. The artist is a full participant in that decision-making process. Always the discussion includes questions such as, “What do you need to make on this piece so that it is sustainable for you?” “What can we do to price this piece equitably for you and attractively for our customers?” Along these same lines, we exchange ideas about design, quality control, and consistent flow of output. In so doing, our experience with the marketplace and theirs about the creative process becomes shared knowledge. Like the flowers, it’s a beautiful thing….